Thin porcelain tile in large-size panels are all the rage. Thin tile installation, however, requires specialized knowledge and expertise as you will learn from this interview with Dan Welch, President, Welch Tile and Stone, a second-generation tile, stone and terrazzo installation company based in Kent City, Michigan. Welch Tile and Marble is no stranger to tile installations that demand high level skills, cutting edge techniques and relentless commitment to the highest standards for installing tile and stone based on the TCNA Handbook. It's in the company's DNA and is how the company has built such a strong reputation regionally and nationally. Given Welch Tile and Marble's strong technical background, it's no surprise that the company is a NTCA 5 Star Contractor, boasts a robust apprenticeship program, encourages and actively supports employees becoming Certified Tile Installers (CTIs), and also plays an important role in tile industry organizations. More specifically, Dan Welch is Chairman of the Board for the National Tile Contractors Association, the Chairman for the NTCA - US Apprenticeship Program, participates in the NTCA Technical Committee and an alternate for the TCNA Handbook Committee. Dan participated in the very first CTI testing program when it launched at the 2008 Coverings show and became CTI #001. He was a member of the first Advanced Installer Certifications (ACT) class that launched in 2012 (see How Installer Certification Can Change Floor Installation Industry), and one of the first to take the ACT test for thin porcelain tile installation in 2015. What you'll find as you read this article is that Dan is a fascinating combination of hands-on installation expertise, intense customer focus and big picture tile industry perspective. He's always thinking about how to do things better, how to continuously challenge himself and his team and how to inspire future tile contractors and installers. Every year during Coverings, the largest tile & stone exhibition in North America, the best and most expert tile installers collaborate with the most talented architects and designers to demonstrate what's possible in a tile installation that unfolds over the few days of the show. 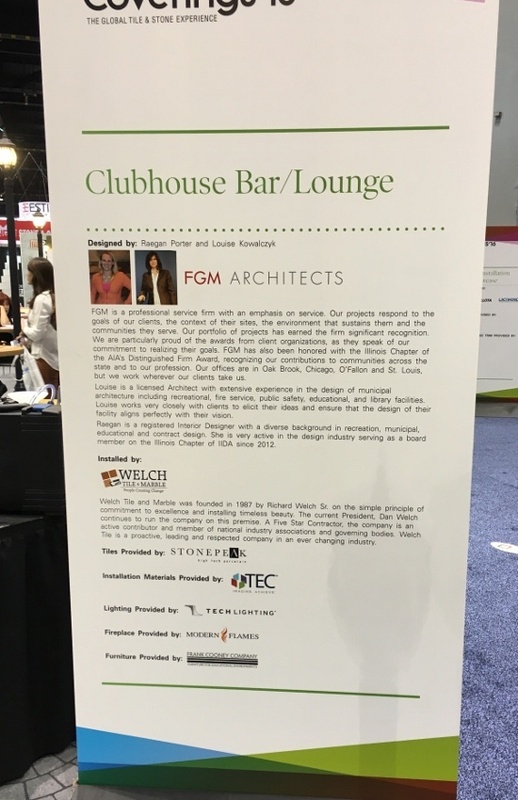 During Coverings 2016, Welch Tile and Marble, teamed up with FGM Architects, led by Louise Kowalczyk and Raegan Porter, to create a clubhouse bar and lounge space for the Installation Design Showcase (IDS). This project used thin porcelain tile from StonePeak to demonstrate the versatility of how to use tile beyond the expected. It also represented a first in that the project was created in a shipping container so it could be reused for educational purposes rather than be landfilled at the end of the show. 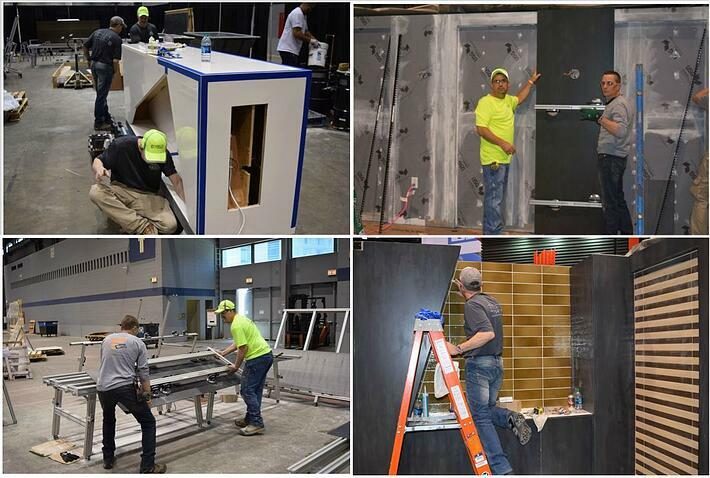 CTEF: Dan, how many Installation Design Showcases has Welch Tile and Stone participated in? DW: We did the very first one in Orlando in 2010, then again in 2011. CTEF: Dan, what kinds of tile installation challenges did the Clubhouse Bar and Lounge design represent? DW: The Clubhouse Bar and Lounge featured thin porcelain tile from StonePeak which can be a challenge. We were working with 5x10 foot pieces that were 5.6mm thick and it took a while to set up tables and cutting boards before we could even start the installation. We faced a learning curve, too, because the largest size we had worked with to this point had been 3x9 foot pieces and the additional dimensions added to the complexity of the installation. And then we created effects with tile we had never done that before! The bar, for example, was all mitered which required making angle cuts with a mitre machine. We also had to scribe patterns for an exact fit. CTEF: Didn't this Design Installation Showcase represent another first for Coverings and for Welch Tile and Stone? DW: Yes. 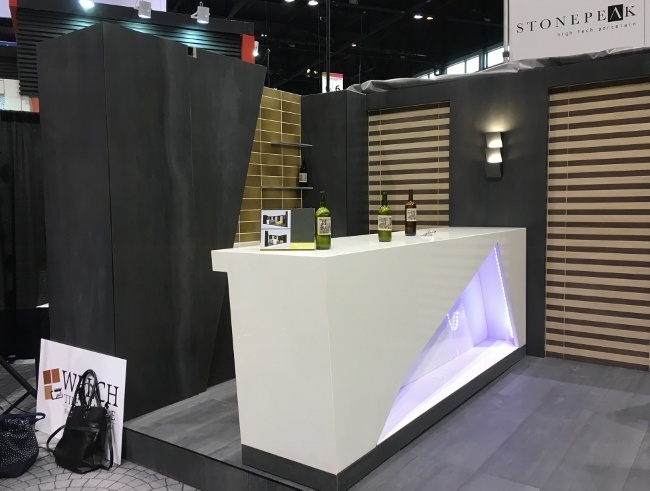 Rather than simply build the vignette at Coverings and then see all of the work and the materials go into a dumpster at the end of the show, we decided to build it in a shipping container so the installation could serve multiple purposes. We got the idea after completing the TCNA booth for many years and, at the end of each show, seeing the tile be landfilled. It just makes sense to come up with a better solution. To make the shipping container idea work, we did a lot of pre-work with FGM Architects to fit the fireplace and the bar ahead of time and work out the bugs. We also created a foam block to build the container out so we had a 10x20 foot vignette for the Design Installation Showcase. We were able to get the floor and the backer board in before we got to the show. That was a good thing because it took so much time to put the large format porcelain tile cutting tables and tools together. When Coverings 2016 was over, we were able to bring the Clubhouse Bar & Lounge home to Michigan. The following week, we used it during a job fair to educate and attract young people to the tile trade. We now have it in the parking lot in front of the Welch Tile and Marble showroom so customers can see what thin tile installation looks like. 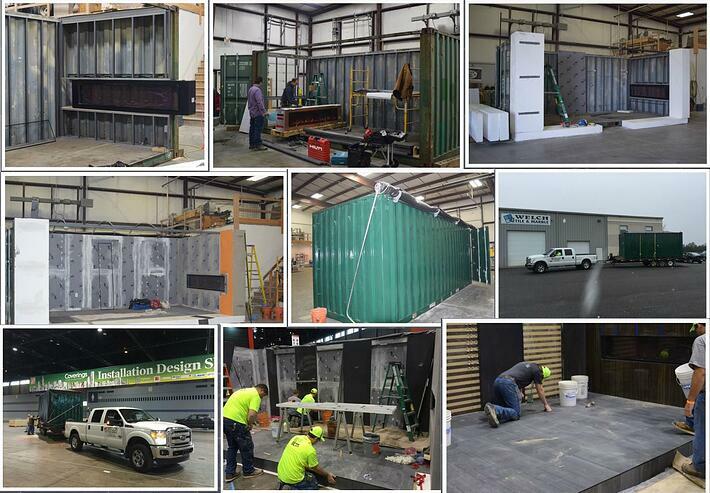 Here are some images to give you an idea of how this shipping container-based vignette came together. CTEF: How different is the IDS work environment compared to a real-world installation? DW: Well, you're definitely under the gun. And, you're always trying to figure out the different elements of the installation – the lighting, the fireplace, the mitering. It's not really different from a real-world installation, other than having lots of people watching. It's long days, a tight timeframe and an interested audience. CTEF: Were changes made during installation? DW: There were no changes made during the installation. Everything was well pre-planned so we could do the studwork and the electrical ahead of time. The pre-planning, though, represented lot of hours of communication ahead of time so we could have a piece ready to finish. We worked closely with the design team; they detailed all the specifications on drawings so we could work efficiently with the other trades; the fireplace was shipped to the shop. Such a project can be a mess when you don't have good information. That's where detailed drawings make all the difference. CTEF: What could have gone wrong had a less experienced and talented tile installation team been involved? DW: When it comes to working with large format thin tile, cutting and fitting the tile is exponentially worse because there is no room for error. In this case, especially on the bar where we mitered the tile. With smaller-sized tile, you can spread joints open. You have much more flexibility for making adjustments. With large-size thin tile, you need to start all over again if you don't have it right the first time. Every cut is a finished cut. This is definitely a case of "measure twice, cut once." Then, from a team perspective, it's critical to figure out how to work together so you can maneuver a big piece of tile onto a wall. Remember, these are 5x10 foot pieces. It takes 3 to 4 to people to set a piece. You need to have the whole team know what's going on - leaders, helpers, workers - so you can execute the plan. For thin tile installation, you need to communicate clearly and calmly and make sure everyone knows what each is doing and how you will coordinate to place the pieces. CTEF: Dan, what observations can you share with us about the value of having Certified Tile Installers involved in your business? Having each of my installers become Certified Tile Installers was the single biggest thing I could do to prove to homeowners and architects and designers that my company offers true craftsmanship and the ability to perform something that will last a lifetime. As a result of the Certified Tile Installer program, I've made changes in Welch Tile and Stone's hiring practices. Any individuals we hire have to take the CTI if they say they're a tile setter. They don't have to pass. However, it helps us know where to place them. It's a really good gauge for apprentices, too. Yes, it's expensive, but it helps put people on the same page. It takes a certain individual who understands and wants to learn from mistakes. And then we make sure the people we hire have the right path ahead of them. It takes confidence to be a tile setter because you need to be able to make decisions. CTEF: Do you encounter pushback from homeowners or architects and designers who may not appreciate expert installers? DW: Typically, design professional teams know who Welch Tile and Marble is and feel a sense of relief. They know how highly we value collaboration, communication, training and quality tile installation; they trust us. What's difficult is when people aren't willing to pay for expertise, quality tile installation and using the right tools. There's a huge difference between doing it right the first time and doing a quick poor installation that quickly turns into a problem. CTEF: Thank you, Dan, and congratulations on an outstanding Installation Design Showcase! Have you attended Coverings and seen the Installation Design Showcase in person? It's an amazing sight that truly makes you appreciate when talented professionals come together to create beautifully tiled spaces. You can, too, using Certified Tile Installers for your next tile project.